All our figures and metal parts are Lead Free. Take care of your health and those you love! Do you want the very best Italian quality and craftsmanship? Then Baueda is for you! Welcome to our online shop and catalog where you'll find all our products directly from the developer and manufacturer of the highest quality tabletop wargame accessories and miniatures! Make sure to check out this page often for the latest news, as we are constantly expanding all our ranges! Even better, to keep always up to date, come see us on Facebook, follow our Blog or join the BAUEDA Yahoo group! Most important of all anyway, please be warned that ALL our products are not toys and are not intended for children of any age! still can't find it? drop us a line! The most innovative and exciting WWII skirmish game in town! Want Vikings? Romans? Normans? Always been looking for incendiary pigs? You've come to the right place! Never mind, we have done it for you! Looking for the best scenics for your WWII games? great looking camp for it! Using this modular system you can create field fortifications, impregnable stronghold and even entire walled cities for a large variety of ancient armies! 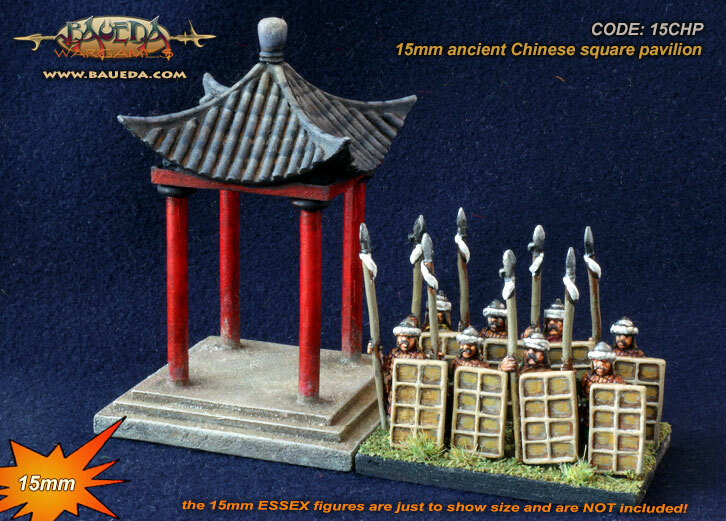 15mm ancient buildings, towers and city walls! Bored with mainstream Fantasy settings? Try THIS! Our ranges are also available from a number of resellers (Shops & Distributors) worldwide. 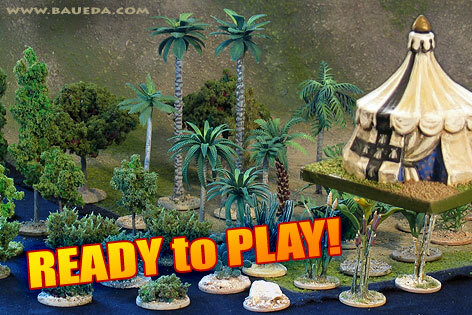 Support your local wargame shop, find your nearest BAUEDA Retailer here! Do you like 1:72 plastic soldiers? Don't miss plastikornar then! HOSTIS: 15mm Caesar’s army (Marian Roman)! Alea iacta est! 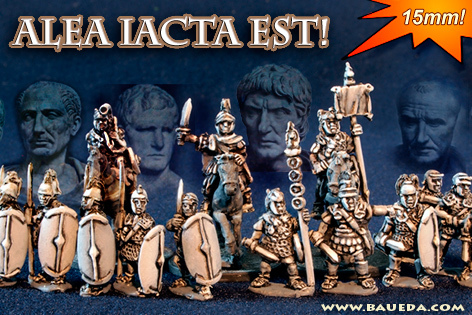 Check out our fabulous new 15mm Late Republican Roman range! The conquest of Gaul, the invasion of Britain, the Civil War, Spartacus revolt! Caesar, Anthony, Pompey, Crassus, Sertorius: a well researched, high quality and comprehensive range for the most exciting period of Roman history! 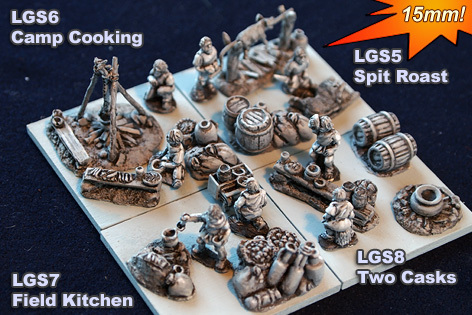 Our ever-growing selection of logistic now include four brand new codes of exquisitely crafted 15mm camp figures and accessories, perfect for any army from Ancient Classical times to the late Middle Ages! latest update: READY to PLAY gets more trees!! Five new style of trees have been added to the selection!!! In the Ready to Play area you will find all sorts of hand assembled and hand painted high quality models ready for your gaming tables! 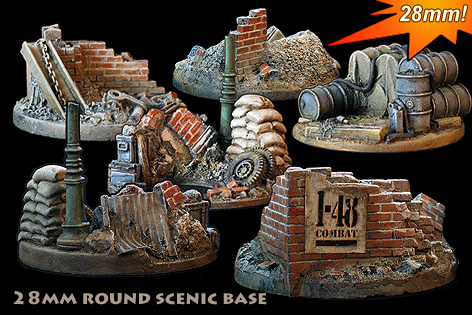 Our 15mm WWII range which includes nearly 40 different packs of scenic bases, objectives, bunkers, fortifications and entrenchments is now also covering desert theatres! Finished models painted to the highest quality, based and flocked: ready for the tabletop!